Assembled from spare drum machine beats, molasses melodies, and galloping guitars and held together with piano wire and tape delay, this strange mutant longs to make its way across the irradiated American frontier and onto your humble turntable. Where recent previous releases were focused outward on the futurological landscapes of Brazil, Germany and the UK, here the material ranges closer to home: Oakland, Houston, Los Angeles, Memphis (with a side-trip to Pluto). We hope you will wrap your arms and ears around it. 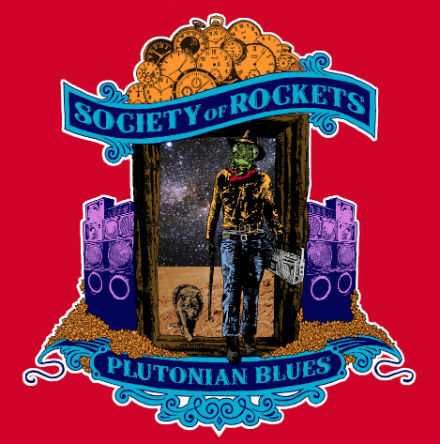 "Plutonian Blues" was recorded during 2013 and 2014 in San Francisco at Light Rail Studios. It was produced and engineered by the band with Chris Cline (...And You Will Know Us By the Trail of Dead, STEREO IS A LIE, The Foreign Resort) and mixed by Chris Cline. Mastering was performed by Gary Hobish (Willie Nelson, Dr. John, Creedence Clearwater Revival). Get it on vinyl or high-quality digital download at our Bandcamp Store.